It’s a national epidemic finally getting some long overdue attention. To put rising costs in perspective, a dozen oranges today would cost $134 if adjusted at the same rate of price inflation that we’ve seen in healthcare since 1945. And, it’s only getting worse. California health insurance premiums soared 185% since 2002. But we’ve heard these complaints before, it’s not new. 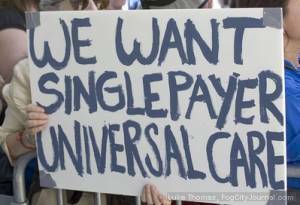 What is new is that the largest unions in San Francisco are doing something to reign in price gouging by insurers like California-based Kaiser Permanente, the nation’s largest HMO with 9.1 million subscribers. 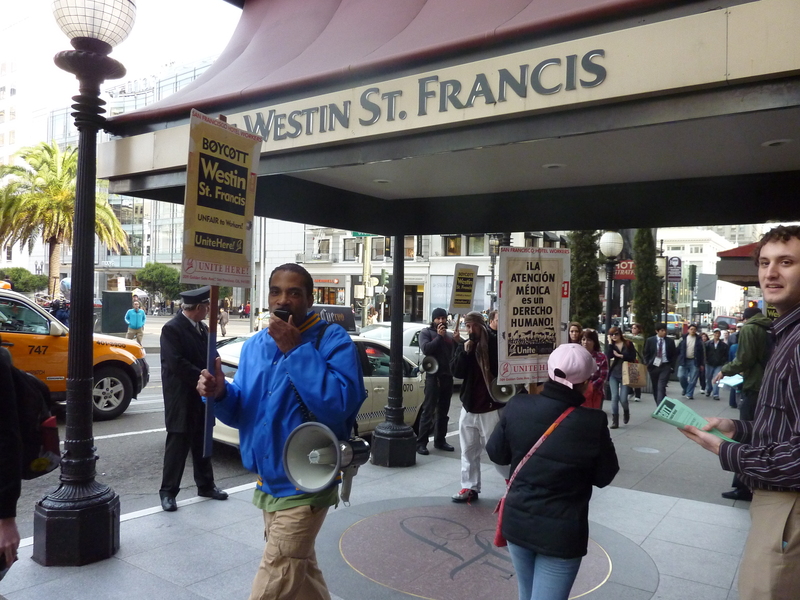 Hotel workers boycott picket line of the St. Francis Hotel on March 16 stands firm even as former President Bill Clinton decided to speak at an event in the hotel. Former president Bill Clinton accepted a March 16 speaking engagement at the San Francisco Westin St. Francis, a hotel which is the subject of a worker-called boycott endorsed by UNITE-HERE Local 2, the San Francisco Labor Council, AFL-CIO, and by numerous political, religious and community organizations. 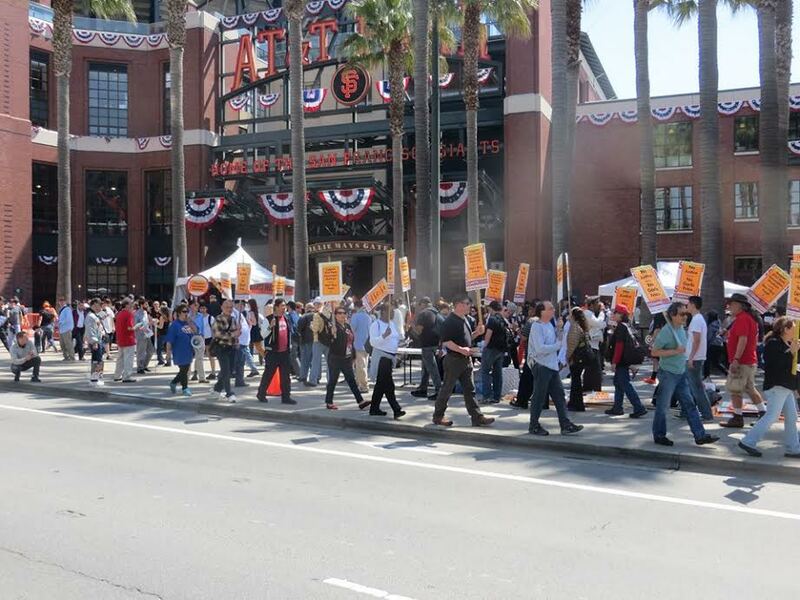 Clinton ignored the boycott but could not avoid union members working inside who confirmed he was present. The former president takes in upwards of $350,000 each time he steps up to a podium with $65 million in documented speaking fees since leaving office through 2009. The Starwood Hotels and Resorts, managers of the Westin St. Francis, are not doing so bad in that department either. According to the February 4, 2011 Wall St. Journal, Starwood’s revenue rose 7.5% last year to $1.34 billion. Except for Clinton’s breach of solidarity, things had been going rather well the last week. Only a few days ago, the respected organization NARAL Pro-Choice for America pulled its luncheon from the Westin St. Francis to another union hotel not on the boycott list. 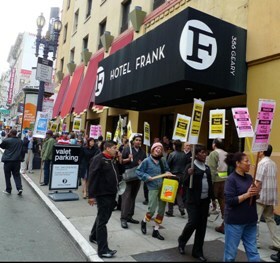 It was also in this same week that hotel workers overwhelmingly approved the breakthrough contract with the San Francisco Hilton, the first hotel to settle among 59 remaining in the 18-month labor dispute affecting over 8000 workers. Yet, in the face of the Hilton settlement, Starwood broke off negotiations and “has shown no urgency to return. 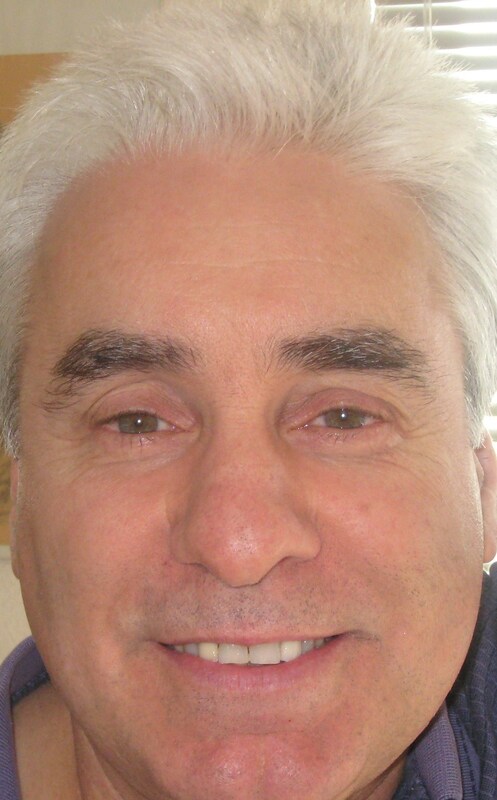 If Hilton can settle on a contract that respects its workers, why can’t Starwood?” asked Riddi Mehta, union spokeswoman. The Hyatt Corporation just posted quarterly profits that jumped six hundred percent with their stock prices climbing at around the same rate. Along with this jumping and climbing, the corporation has taken up running, as in running away from the worst safety record in the industry. Hyatt ranks last in workplace injuries suffered by its housekeeping staff according to UNITE-HERE, the union representing over 100,000 workers in more than 900 hotels in North America. The union is not alone. It cites a peer-reviewed academic study published by the American Journal of Industrial Medicine that places Hyatt dead last among the 50 hotels studied. The abysmal record prompted Hyatt housekeepers at twelve hotels in eight different cities to simultaneously file injury complaints a few weeks ago with the Occupational Safety & Health Administration (OSHA). The union cites public records submitted by the hotels that indicate a 50 percent higher injury rate than the rest of industry. 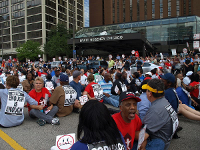 On Thursday, July 22, several hundred people gathered in front of downtown Chicago’s Hyatt Regency hotel to protest the Hyatt chain’s failure to negotiate a new contract and, more to the point, to protest management’s attempt to take back gains made in the previous contract. Management’s rationale being the recession at a time when business at the Hyatt is recovering and the enterprise is, in any case, profitable. 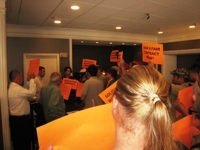 This action was part of a nationwide day of action at Hyatt hotels called by UNITE HERE. Some 17 different actions were held in the United States and Canada. With the exception of a Thursday morning action out at the Hyatt near O’Hare Airport, they all featured civil disobedience leading to arrests. In Chicago, not all those participating in blocking the street remained to be arrested. This was done to allow some police officers time off to attend slain police officer Michael Bailey’s wake and funeral. Not all the participants were happy about this, but everyone behaved in a disciplined and focused manner.